Clockwise around the chess board, from lower left, are: Jake Giarratana, 9, JR Cravotta, 10, and Luke Giarratana, 6, all of Danvers, teacher Sandra Stolle, Owen O'Leary, 6, and Giuseppe Tra, 7, both of Manchester. 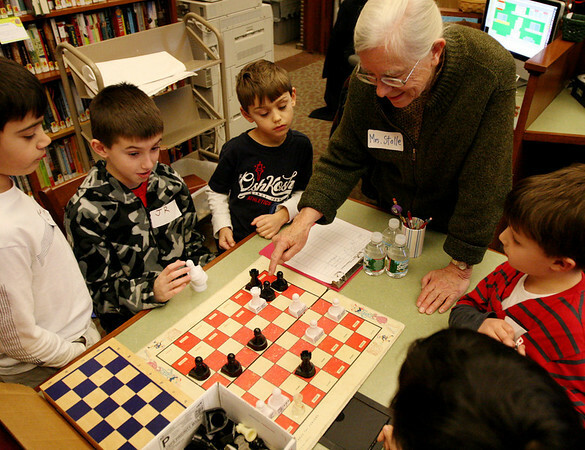 They are taking part in the first of three Chess Club workshops held at the Manchester Public Library in January by Stolle, of Wenham. The free workshops will be held next on Mon. Jan. 23 and Mon. Jan. 30, and may also extend into February. About a dozen children were there learning basic chess rules and strategy on Monday afternoon.